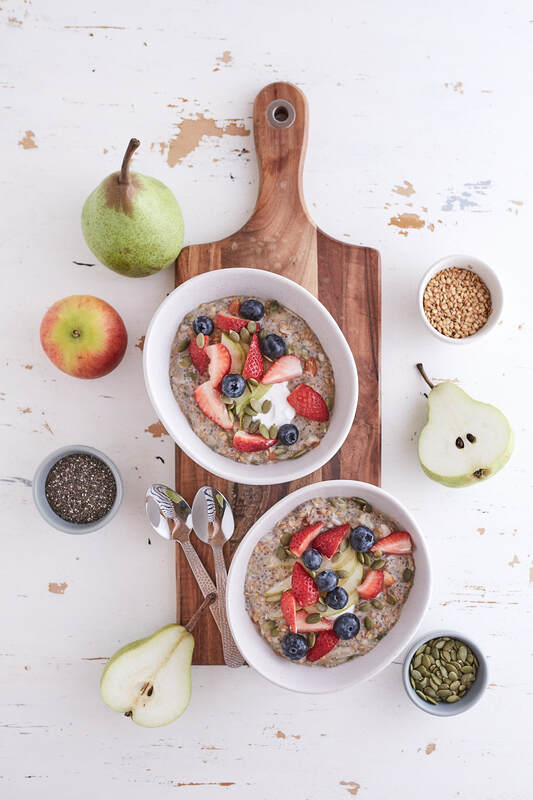 Now that summer is here, (hurray), steaming hot bowls of porridge seem like a long distant memory and instead they’ve been replaced with chilled smoothies and bircher muesli in my house. 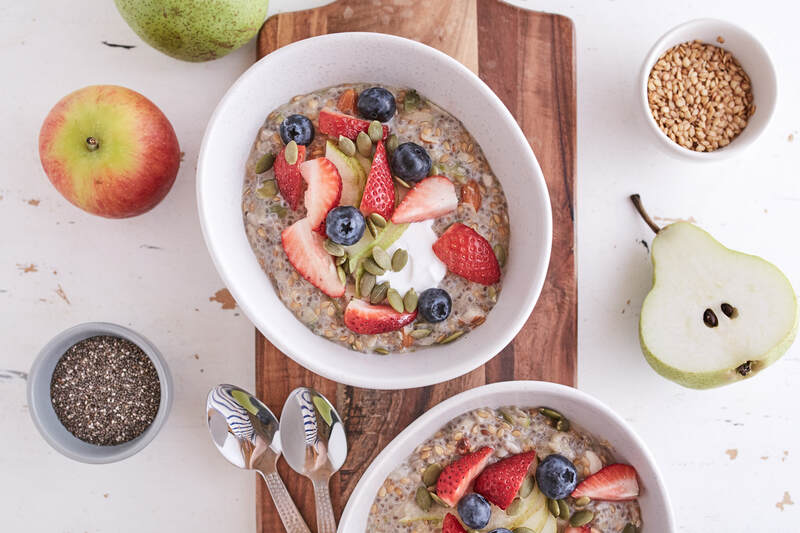 Traditionally bircher is made with rolled oats, grated apple and sweetened condensed milk, but I’ve swapped up a few of these things to make a light, fresh version of bircher that I reckon will rock your breakfast socks off. This recipe is a winner because it takes about 10 minutes to put together, plus overnight soaking, and you really feel like you’ve kicked some culinary goals after you’ve made it. Your colleagues chowing down on their weet-bix and milk will be jelly! Best of all you can portion it up into some jars or transportable cups, top with some yoghurt and berries and pull it out in the morning for a healthy breakfast on the go. 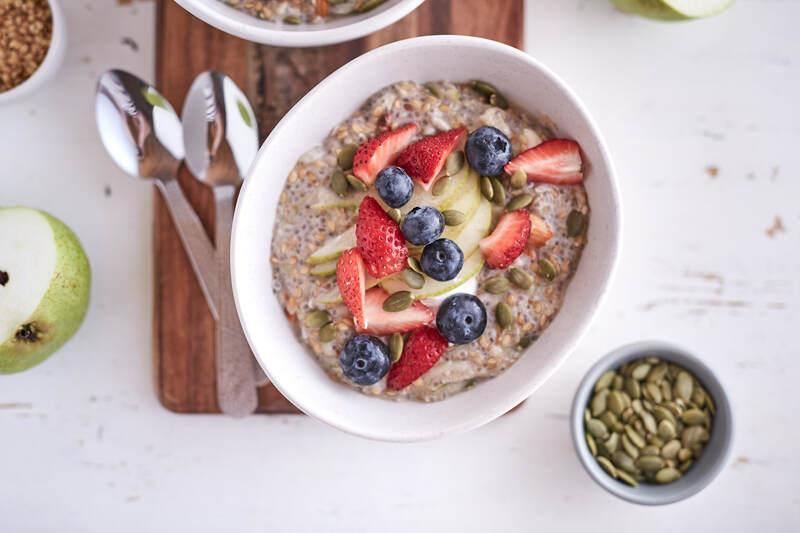 This breakfast is also loaded with omega 3’s from both the chia and flaxseeds, which are essential fatty acids we all should be trying to have more of in our diet. It’s also keto friendly, being low carb and high fat, making you feel fuller for longer. 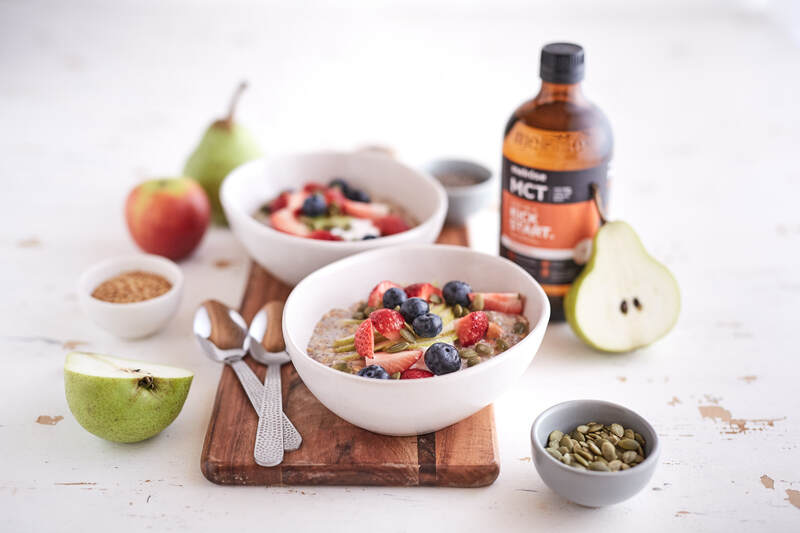 I also love to mix in a little MCT oil for an extra energy boost! If I lost you at MCT oil, check out my article about what it is and why it’s good for your energy levels. I’ve deliberately made this recipe low in sugar, but if something a bit sweeter takes your fancy drizzle over a little raw honey, maple syrup, rice syrup or even add in a few chopped up medjool dates to the soaking mix if you’d like. I hope it’s a winner at your house! PS: Thanks @Ironchefshellie for the beautiful food photography as always! Makes 7 cups, approx. 7 – 9 servings. Place flaxseeds, chia seeds, almond, sunflower seeds, pumpkin seeds, cinnamon and cardamom in a large mixing bowl stir dry ingredients to combine. Add coconut milk and vanilla bean, mix well to combine using a fork. After 5 – 10 minutes, mix again and then cling wrap and place in the fridge overnight to thicken. The next day, grate the apple and place into bircher mix along with the MCT oil and stir well to combine. To serve, place about ¾ cup bircher in a bowl, add a dollop of yoghurt and top with a few slices of fresh pear and berries. To make your own drinking coconut milk, use the ratio 1 cup of coconut milk to 2 cups of water, blend or mix well and store in fridge. This recipe was proudly created for the Melrose MCT oil launch.